On August 13, 2013, Sean Boushie signed a sworn affidavit before a notary, and he swore that Bill Windsor had repeatedly followed and intimidated him. The false sworn affidavit was used to get William M. Windsor arrested and jailed for 134 days. “Mr. Windsor has repeatedly followed and intimidated me." This never happened, and there is no evidence that it did. 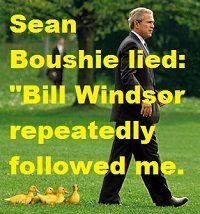 Bill Windsor had never seen Sean B**shie, never attempted to locate him, never followed him, and did nothing but film his movie.